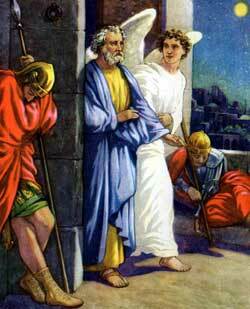 The angel said, “Wrap your cloak about you,” and when Peter had done so they walked out of the cell, past the guards. IT WAS MIDNIGHT;the streets were deserted and all was still. But even at this late hour not all the people of the city were fast asleep. A group of men and women were having prayer-meeting at the home of a widowed woman named Mary. For a long time they had been praying together, but still they continued to pray. These people were believers in Jesus, and again they were being persecuted. Their persecutor now was the wicked king Herod Agrippa, whom the Roman government had appointed to rule the Jews. This Herod was a grandson of the Herod who killed all the little children at Bethlehem when Jesus was a baby, and a nephew of the Herod who caused the death of John the Baptist. Wishing to please the Jews, King Herod became friendly toward the religious rulers of the people. And soon he heard about the hatred that the chief priests and scribes felt toward those who had accepted Jesus as the Savior of men. So at once he began to trouble the believers. Seizing James, one of the apostles, he commanded his soldiers to kill this good man with a sword. And because the Jews were pleased, he decided to kill Peter, too. So he caught Peter and shut him up in prison, intending to keep him until after the feast days, and then bring him out to have him put to death in the presence of the Jews. The church was much distressed by the loss of James, and now when Peter was taken they felt that they could not spare him too. So they prayed daily for his release. But the days passed, and still Peter lay in the dreary prison. Finally the last day came and went but their prayers were yet unanswered. So the church met together in Mary’s home to pray all night. Peter was laying fast asleep, chained to two soldiers. Outside the prison door other soldiers stood on guard, for they knew that before another night Peter would be imprisoned there no longer. They knew about Herod’s plan, but they did not know about the greater plan of God. While Peter was sleeping, an angel from God came into the dark cell where he lay and touched him. The soldiers beside him did not see the angel, neither did they hear him speak to Peter, telling him to rise up. But Peter obeyed, and the heavy chains fell off his hands. Then the angel bade him to put on his sandals, and tie his girdle about his waits. Hardly knowing what he was doing, Peter prepared himself to leave the prison with the deliverer whom God had sent. Then the angel said, “Wrap your cloak about you,” and when Peter had done so they walked out of the cell, past the guards, and on to the great iron gate which opened into the city street. When they came to the iron gate it swung open easily to let them pass through, although it had been tightly locked. The angel led Peter through one street and then disappeared as suddenly as he had come. Now Peter understood what had really taken place. He had moved as if in a dream; but now he was fully awakened. He decided at once to find some of his friends before leaving the city, and tell them what had happened. At the sound of his answering voice she ran into the room where the people were kneeling in prayer and cried excitedly, “Peter is come! Peter is come!” So delighted was she that she forgot to open the gate and let him in. Still she insisted that it was indeed Peter who had answered her call. Then they said, “It must be his angel. While this excitement was going on, Peter stood outside the gate and continued to knock. Soon some one ran out to see, and there was Peter, for whom they had all been praying so earnestly. Then he came into the room, and motioned for them to keep quiet while he told them how wonderfully God had answered their prayer. Peter knew his danger was not yet over, so he bade the happy saints good-by and told them to send to James, a brother of Jesus, and to the other disciples word of his escape from prison. Then he went away to another place. Herod, the king, was very angry when word came to him the next morning that his prisoner had escaped. He questioned the keepers, but they knew nothing about the visit of the angel. They had stood watching at their post, and the prison doors were tightly locked, but Peter was not to be found anywhere. To express his displeasure, the King ordered the keepers to be put to death. Not long after this Herod himself died very suddenly. His death was a terrible punishment of God upon this enemy of his church. And from that time the disciples in Jerusalem were no longer persecuted so bitterly by their foes.